Losing is not an option. I'd be lying if I said it was nice to meet you a month ago. You couldn't have came at a worse time. I was having fun at college with my friends, teammates, and my boyfriend. From my understanding, all sickness from the past couple months were build onto you, leukemia. Of course, like the many unlucky souls you encounter, there hasn't been a day where I don't ask myself "Why me?" I don't mean to sound selfish but out of over seven billion people in this world, you decided to choose to enter my life at such a prime time, my sophomore year of college where I finally started dating the boy that I fell in love with and playing the sport that I love. Why me? It seems like a long ago, but I don't remember most of my first hospital stay. Did I ever mention that I've never had to go to the hospital til you? My parents remind me every day how thankful they are that I am alive, breathing on my own, and able to move around a little bit. Every time they tell me how thankful they are that I am where I am today, it brings tears to my eyes because I want to be in a better place than where I am now. They remind me of their nightmares which was really a reality of the four days I was laying in the ICU, unable to speak to them, unconscious, and in a medically induced coma. Every time my dad tells me the story, he freezes up and can't continue. My mom tries to not repeat the story and relive the nightmare of where she almost lost her only daughter. From the the little over three week hospital stay of where I lost over 30 pounds and probably had a hundred visitors, I only remember bits and pieces and the last couple of days. I remember my parents giving up sleep to be by my side a couple minutes longer even though they had work in a couple of hours. I remember my mom having to leave my room because she was trying to hide that she was crying. Little did she know how much I wanted to chase after her and bring her tissues but I couldn't move much more than my arms. I remember my teammates and my coach visiting me in the hospital bed where I could barely get up before they head to a tournament that I so wish could be playing in as well. I remember sending broth, jello, and water back for almost two weeks because I was only allowed to eat liquids. I remember my friend's mom giving up her time to spend at her own home, in her own bed with her husband and kids just to be at the hospital at night with me so I won't be alone. I remember my boyfriend sacrificing his weekends to stay with me even though he'd seen the worst of me in the hospital. And I remember the first time I untied my hair where a handful of my hair fell out and I wanted to believe it was because I hadn't brushed it but I knew inside it was because of the chemotherapy. Leukemia, you have stolen enough from me. I have spent a lot of time crying since you came into my life and to be completely honest, I probably won't stop crying about you for a while. But I also want you to know that you have brought my family closer and stronger. My mom and I have shared countless amount of stories while I was in the hospital and I hope to share dozens more throughout the rest of the chemotherapy I have left. You brought my family closer to God. As much as I may question why all this happened, I also believe he has a bigger and better plan for me. Although I lost most of my eye sight to you, leukemia, Jesus did once heal a blind man so I believe he will heal me too. You have shown me how many people truly care about me with all the support. 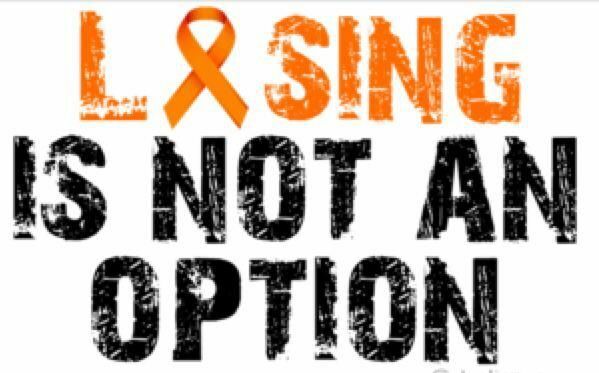 Leukemia, you messed with the wrong girl because I'm not losing this fight. I'm gonna win this fight and go running every Sunday morning like I used to with my dad. I can't wait to go shopping again on Saturdays with my mom, even though we may only buy one or two things at the end of the day, we always had such a great time. I can't wait to go back to school and finish my degree and become the physical therapist I desired to be. And I can't wait to go back on the golf course healthier than ever, making more birdies than before. I don't like losing, and I definitely won't lose to you, leukemia. You know a narcissist right now, but you don't actually know who it is. There is a distinct connotation to the word narcissist, and there is a reason for that. So let's all figure out who it is together and get rid of the negativity for good. There is most likely a narcissist in your life whether you know it or not. I got this great idea to talk about spotting a narcissist from an IGTV post on Instagram by ATTN because I believe that it was really beneficial to hear the information being said. We are supposed to be happy and going back to the negative connotation of the word narcissist, I feel as though to be happy all the time, we shouldn't let negatives be apart of our lives. Now, narcissists are not the same as being self-conceited, being self-conceded I would define as the lower and more human level to a narcissist because they still know how to be human. Sometimes the self-conceited people can be mistaken as overconfident people and as much as they have similar, there are also differences. But, I am not talking about these two right now, we are going straight to the extreme. The first trick to spot one is in their sense of humor. Normal human beings are OK with joking about themselves sometimes. If a friend starts making fun of them about how they entered a room, usually the person that entered the room weird would laugh along with their friends and agree that they entered that room weird. Narcissists would get angry that someone would make fun of them and will never laugh at their small flaws. Next sign would be how a narcissist will interrupt peoples conversations all the time. Narcissists only like to talk about themselves, so if the topic of conversation isn't about them, they interrupt the conversation just to change the topic to their own life and problems. To me, this is the "ah ha" tip that people will finally realize the people in their lives. Just realize that sure self-conceded people can do this too, however, they don't do this all the time and know how to communicate with people without just talking about themselves. Narcissists like to make themselves seem untouchable, they shame normal things that people do just to give themselves a boost higher. Even if it is everyday tasks like cooking for yourself or for normal interactions with people like being friendly to your neighbors. They could even go to the extreme as making sure you know that they are more liked by your own boyfriend than you. Or the slightly lesser of evil, make you unsure about it. If they have been in the proximity of a celebrity, they will let you know about it at least once a day. This is how they make themselves feel superior to you. Jealousy is the fuel of this whole narcissist image, but to me, this topic is also pretty confusing. Since jealousy is the fuel of this whole charade, it can be driven in many different ways. All in which normally come from a strand of jealousy. Whether it's them being jealous of other people or feeling like the other people are jealous of them, it has a soul purpose that leads them to act the way they do. Also because of this jealousy, they think they can get away with whatever they feel like. These people feel so superior that they think they can do anything they want making them more superior. Whether there are rules in place or not, they will do what they please with no thought of other people. They are likely to steal from businesses or cut in line. They will even go against friends beliefs and rules. Narcissists then put a big situation on friends because if they were to let it go, it then reinforces to the narcissist that they are okay with the bad behavior. Now, Is everyone in your life a narcissist because they do one thing in this article? No! Please, do not start hacking away at your friends because they show traits of narcissism because even though these are specific acts of a narcissist, these acts could also be a form of something else. I just wanted to write about this because, for that one reader that does have a narcissist in their life, they can be more aware and use this knowledge to their benefit when handling one.